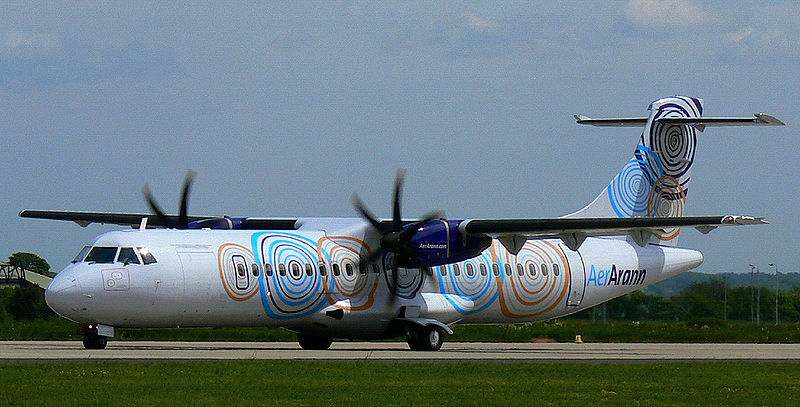 The ATR 72 is a twin-turboprop short-haul regional airliner built by the French-Italian aircraft manufacturer ATR. It seats up to 74 passengers in a single-class configuration and is operated by a two-pilot crew. The ATR 72 was developed from the ATR 42 in order to increase the seating capacity (48 to 68) by stretching the fuselage by 4.5 m (14 ft 9 in), increasing the wingspan, adding more powerful engines, and increasing fuel capacity by approximately 10 percent. The 72 was announced in 1986, and made its maiden flight on 27 October 1988. Exactly one year after that, on October 27, 1989, Finnair became the first company to put the plane into service. At least 408 ATR 72s have been delivered worldwide with orders pending on at least 28 more. Passengers are boarded using the rear door (which is rare for a passenger plane) as the front door is used to load cargo. Finnair ordered their ATR 72s with front passenger door so they could use the jet bridges at Helsinki-Vantaa airport. A tail stand must be installed when passengers are boarding or disembarking in the case the nose lifts off the ground, although this has never happened. The ATR aircraft does not have an Auxiliary Power Unit (APU), but it has a propeller brake (referred to as "Hotel Mode") that stops the propeller on the #2 (right) engine, allowing the turbine to run and provide air and power to the aircraft without the propeller spinning. This eliminates the need for the added weight and expense of an APU. Initial production variant powered by two PW124B engines and certified in September 1989. Two sub-types were marketed as the 200 series (-200) The -200 was the original production version, powered by Pratt & Whitney Canada PW124B engines rated at 2400 shp. Two sub-types were marketed as the 210 series (-210), the -211, (and with an enlarged cargo door, called the -212), is a -200 with PW127 engines producing 2,750 shp (2,050 kW) each for improved performance in hot and high-altitude conditions. Difference between the sub-types is the type of doors, emergency exits. 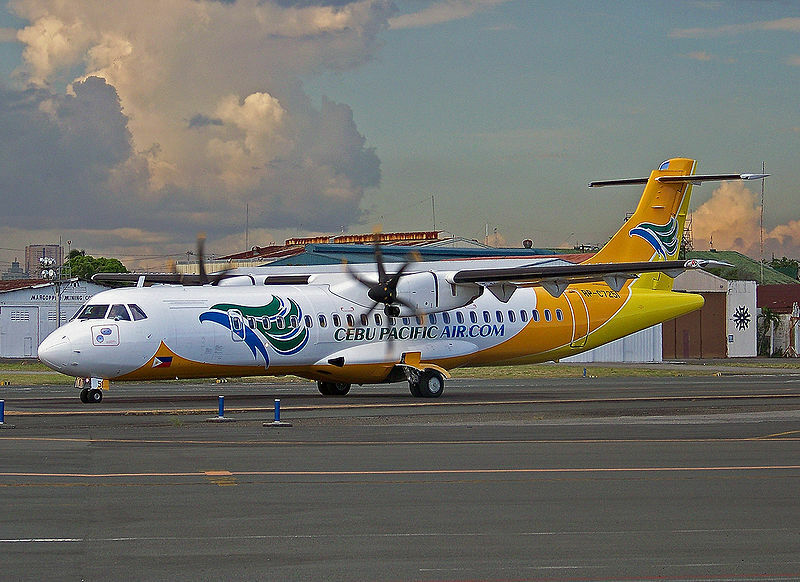 Cebu Pacific ATR-72 at the Ninoy Aquino International Airport. Marketed as the -500 and certified in January 1997 with either PW127M or PW 127F engines the -212A is an upgraded version of the -210 using six-bladed propellers on otherwise identical PW127F engines. Other improvements include higher maximum weights and superior performance, as well as greater automation of power management to ease pilot workload. On Tuesday 2 October 2007, ATR CEO Stéphane Mayer, announced the launch of the new -600 series aircraft at a Press Conference held in Washington, D.C.. The new ATR 42-600 and ATR 72-600 will feature the latest technological enhancements while building upon the well-known advantages of the current aircraft, namely its high efficiency, proven dispatch reliability, low fuel burn and operating cost. It will include the new PW127M as standard engine, Glass Cockpit flight deck featuring five wide LCD screens that will replace the current EFIS (Electronic Flight instrument System). In addition, a multi-purpose computer (MPC) will further enhance Flight Safety and operational capabilities. The new avionics, to be supplied by Thales, will also provide CAT III and RNP capabilities. 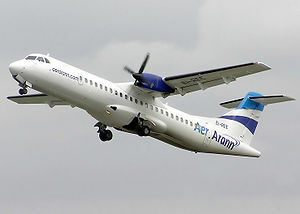 The -600 series ATR aircraft will be progressively introduced during the second half of 2010. ATR unveiled a large cargo door modification for all ATR 72 at Farnborough 2002, coupled with a dedicated cargo conversion. FedEx, DHL, and UPS all operate the type. A VIP version of the -500 is available with a luxury interior for executive or corporate transport. An anti-submarine warfare (ASW) variant of the -500 (itself a version of the maritime patrol variant of the ATR 42-500) is also in production and has been selected by Turkish Navy and Italian Navy for ASW and anti-surface warfare (ASuW) duties. Ten aircraft will be delivered to the Turkish Navy beginning in 2010. Italy's order of four aircraft will begin deliveries in 2012. For ASW and ASuW missions, the aircraft will be armed with a pod-mounted machine gun, light-weight torpedoes, anti-surface missiles, and depth charges. They will also be equipped with the AMASCOS (Airborne Maritime Situation and Control System) maritime surveillance system of Thales, as well as electronic warfare and reconnaissance systems, and will also be used for maritime search and rescue operations. 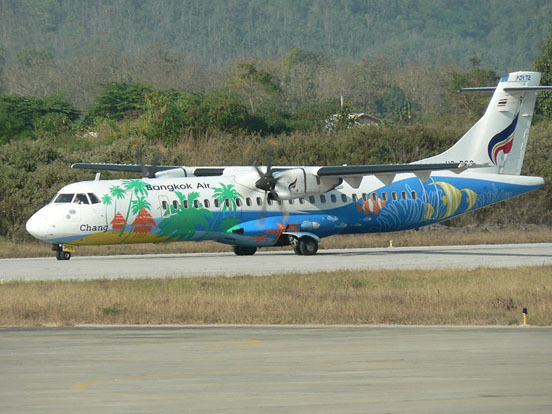 47 other airlines also operate the type in smaller numbers. American Eagle Flight 4184 crashed due to icing on 31 October 1994 in Roselawn, Indiana. The accident had a significant effect on procedures for dealing with ATR in-flight icing as well as US airlines' utilization of ATR aircraft in specific geographical areas. After a period of mandatory grounding, American Eagle and Delta Connection permanently stopped using the plane on temperate routes. 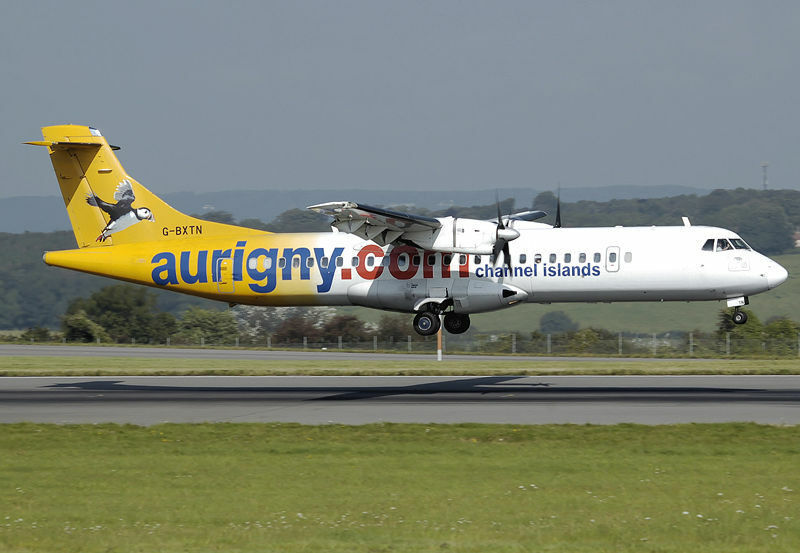 Since the Eagle incidents, ATR had improved the anti-ice boots, though ice-related incidents continued with the type, including a 2001 crash (see below) and a 2009 event where a smaller ATR-42 variant crashed during landing, in icy conditions. Despite this, ATRs are still used in European markets, including the climate of the Nordic countries. TransAsia Airways (TAA) cargo flight 79, an ATR 72-200, crashed due to icing on 21 December 2002 during flight from Taipei to Macau. Both crew members were killed. The plane encountered severe icing conditions beyond the icing certification envelope of the aircraft and crashed into sea 17 km southwest of Makung city. The Aviation Safety Council of Taiwan investigation found that the crash was caused by ice accumulation around the plane's major components, resulting in the aircraft's loss of control. The investigation identified that flight crew did not respond to the severe icing conditions with the appropriate alert situation awareness and did not take the necessary actions. American Eagle Flight 5401 crashed on landing in San Juan, Puerto Rico during a failed go-around attempt on 9 May 2004. Seventeen people were injured, but there were no fatalities. On 6 August 2005, Tuninter Flight 1153, a Tuninter ATR 72 en route from Bari, Italy, to Djerba, Tunisia, ditched into the Mediterranean Sea about 18 miles (29 km) from the city of Palermo. Sixteen of the 39 people on board died. The accident resulted from engine fuel exhaustion due to the installation of ATR 42 fuel quantity indicators in the ATR 72. On 24 August 2008, an Air Dolomiti ATR 72 en route from Munich, Germany, to Bologna, Italy, abandoned take off after the pilot announced a smoke alarm. The airline treated the plane's evacuation as a mild incident. On 26 August, an amateur video, filmed by a bystander, showed 60 passengers jumping from and fleeing the burning plane before fire department workers extinguish the flames. On 26 December 2008, a Mount Cook Airlines ATR 72-500 en route from Wellington to Christchurch, New Zealand, lost power in its right engine one minute after takeoff. A passenger reported seeing something hit the engine and smoke from the engine filled the cabin through the air conditioning system. An Air New Zealand spokeswoman said the airplane's pilots saw a warning indicator light and shut down one engine. Air New Zealand engineers are investigating the cause of the engine failure.